There are lots of benefits to choosing a childcare program like daycare or preschool for your little one. In order to reap those benefits, though, quality matters. To help you determine if a program is a quality one, we’ve collected expert advice—including tips from the National Association of Education for Young Children (NAEYC). Your first step is visiting potential programs, meeting the director and teachers, and observing the teachers interacting with the children. Here’s what to look for to ensure your little one gets quality care. • Warm, supportive, and rich teacher-child interactions. Are teachers physically on the children’s level? Are they responding to the children’s needs? Do they interact with the children by engaging in meaningful back-and-forth (responding to babies’ babbling, for instance, or asking toddlers questions that encourage curiosity and problem-solving). • Licenses. The program should not only hold a current license, but adhere to regulatory guidelines (keep adult-to-child ratios accurate, for example). • Qualified leadership. NAEYC recommends that administrators have a degree from a 4-year college, as well as specialized courses in early childhood education, child development, or a related field. • Teachers with education related to infant and toddler development, as well as opportunities to receive ongoing education. • A small adult-to-child ratio. Guidelines vary, but the NAEYC recommends a 1:3 ratio for babies 12 months old and younger, and a 1:4 ratio for toddlers ages 12-24 months. These age groups should be separated, as their developmental and supervision needs are different. • An evidenced-based curriculum that encompasses social, emotional, physical, language and cognitive development. • A balance of structured and unstructured play. Structured activities help childcare programs organize the day and teach children skills, but opportunities for free-play are important for all areas of development. • Involved parents. The amount of parental involvement varies by program. At a minimum, communication between administration, teachers and parents should be open, and parents should have opportunities to observe and/or participate in the classroom. • Assessments. 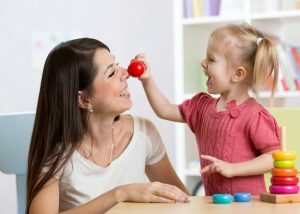 Quality childcare programs will monitor and be able to talk to you about your child’s development and individual interests, strengths and challenges, as well as any developmental red flags that may merit evaluation. You may even ask if they are using our BabySparks program for childcare providers. Aside from quality, it’s important that the childcare program you choose is a good fit for your family. You can read more about finding a good fit here.